My juicer has been getting a lot of use lately as I’ve been experimenting with new juices. I have never juiced kale before but I bought some beautiful dinosaur kale at the farmer’s market this past weekend and was eager to try juicing it. Adding kale into my juice seemed like a great idea because of it’s huge health benefits. Kale is very low in calories yet very nutrient rich. It also helps to detox the body and keep your body healthy. Kale is even thought to help lower your risk for many cancers. So because of all of these great things, I decided to put it in my juicer. I ended up deciding to juice it with spinach, cucumber and apple. What I ended up with was a very healthy, delicious and clean juice! 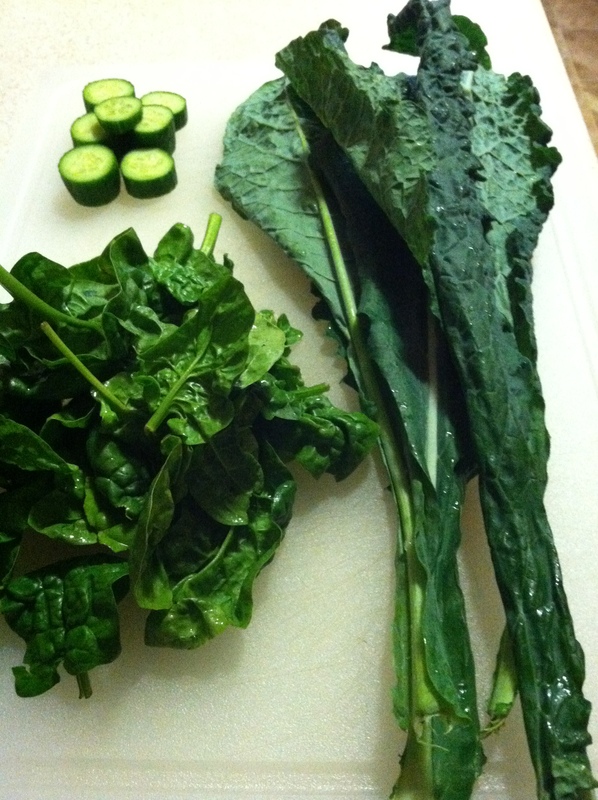 Simply wash your spinach leaves and kale leaves well to remove all dirt, and then also wash your cucumber and apple. Cut into juicer friendly chunks and juice away. The kale and spinach may be hard for your juicer to process. To help your juicer with these harder to juice vegetables, simply alternate with spinach/kale and then the cucumber/apple chunks. The cucumber and apple have a higher juice yield and, therefore, will help to push the spinach and kale through your juicer. Once you’ve juiced your spinach, kale, cucumber and apple, then pour into a glass and enjoy! One serving of this spinach kale cucumber apple juice will give you 261 calories and 54 grams of carbohydrates. It will also give you almost 3,000 milligrams of potassium and 16 grams of protein. What I think is most impressive about this juice is that it gives you great amounts of 4 vitamins as well as high amounts of 13 different minerals. You are getting 46% of your daily vitamin E, 59% of your daily vitamin B-6, 370% of your daily vitamin C, and over 1000% of your daily vitamin A. In terms of minerals, you are getting so many but I’ll point out a few here. You are getting 56% of your daily calcium, 68% of your daily iron, and 181% of your daily folate. Just curious, where do you usually get your ingredients from? There’s a farmer’s market every Saturday from 3pm to 6pm in the Mansfield town hall parking lot next to the high school. I try to get most of my produce from there to support the local farms and also because the fruits and vegetables are more fresh. Anything I can’t get from there, I get at Stop n Shop in Willimantic, which seems to have more variety and organic options than Big Y. Hope this helps! Found your site-liked!! 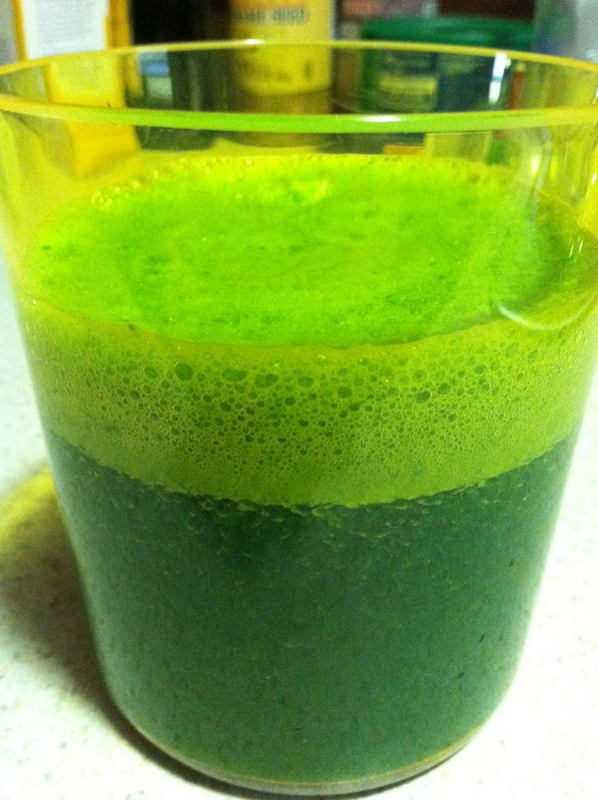 Tried the Kale, Cucumber and Apple drink… I added Ginger, Carrots and ice cubes using my Vita Mix Juicer Just great!! Really smooth… I joined your site for the juice drinks…. Thank you! I’m really glad you enjoyed the recipe. Sounds like you got creative with it. Your juice sounds delicious! How many ounces is the serving size listed? Thank you! It makes about one cup or 8 ounces. Hope that helps! Google search brought me here , as i was trying to find out the calories in the same juice i made . I think the recipe calculator doesn’t consider pulp . do you think it is accurate ? Also what do you do with your pulp ? throw it in Garabage ? The nutrition facts are supposed to be an estimate. The actual amounts are going to vary depending on your juicer and how much pulp makes it through to your juice. If there is less pulp, then the nutritional facts will vary slightly because you won’t be getting as much fiber. As for your question regarding the pulp, I compost it, and it eventually becomes a rich soil that I use to garden. Some people use the pulp for other recipes. I haven’t tried this but I’m sure you could look it up on Google and find more ways to utilize the pulp if you didn’t want to compost it or just throw it away. Hope this helps! This recipe is awesome! Thank you so much for sharing it! I usually add an orange, carrot, parsley, and cilantro. Comes out great! I do have a question. Is the protein content accurate? How were you able to calculate the nutrition facts? I would like to know how to calculate my own concoctions. Do you use the info from the whole source or use a special juice content into sheet? I have been using this as a post run/workout juice but it still seems too good to be true to me! I do know that kale does have a ton of amino acid chains so it isn’t too shocking to see that there is over 16g of protein in just one cup of this stuff. Thanks! The calculations for the nutrition facts are an estimation. For example, you lose some of the fiber when you juice, so that is hard to accurately reflect in the nutrition facts. I use Sparks Recipe Calculator to determine the nutrition in my juices and food I make. There are a variety of other nutrition calculators out there though. I know some people prefer to use WolframAlpha where you can put in the exact amount and have it calculate it for you. I personally prefer Sparks calculator but if you don’t you can always try the other one I suggested or google around for others that might best fit your need to determine the nutritional value.